Orientation of the model in the prep software is by far one of the most important considerations when operating a 3D printer using FDM. Poor orientation can directly impact strength, time, quality and the amount of products you can fit on the print bed. 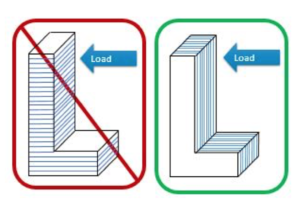 Strength is impacted when the layer structure of a part goes against the force acting on it. 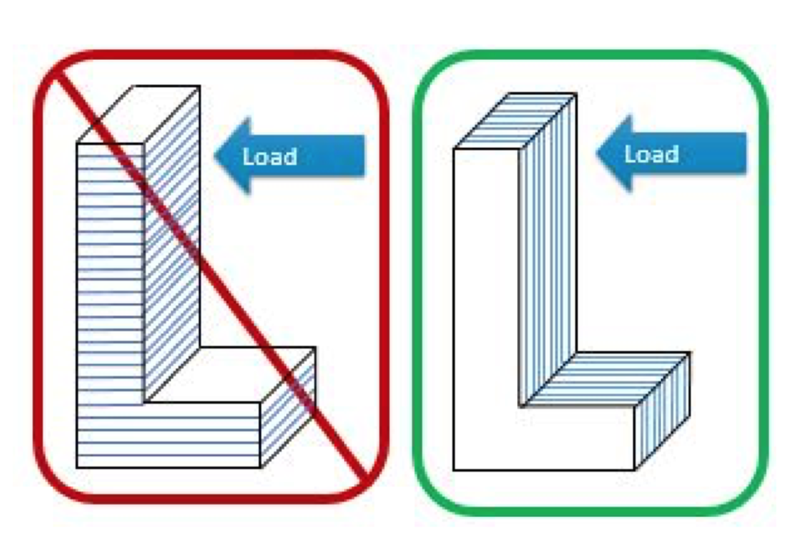 From the image you can see the part in the green box, is stronger when force is acting in this way than the same part on the red box, because of its layer structure. For functional parts, it is important to consider the application and the direction of the loads. FDM parts are likely to delaminate and fracture when placed in tension in the Z direction compared to the XY directions. Part quality is intrinsically linked to the orientation of the model, placing a part in the Z direction would take longer but would be of greater quality than one placed horizontally. A good rule to follow is to orientate any cylindrical features vertically for a smoother surface finish.